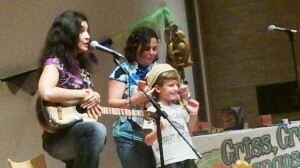 “It was a delight to have Criss Cross Mangosauce be a part of the Wonderful Wednesdays Children’s Performance Series. Our family audiences enjoyed your lively selection of music and storytelling while experiencing Latino culture and Spanish language. We also appreciate you doing a bonus session with our NCMA summer campers following the performance and introducing them to even more fun bilingual music, stories and games. Diana Suarez Phillips, Education Department , North Carolina Museum of Art, Raleigh, NC.